LONG BEACH, Calif. — A fast start and slow finish resulted in a road loss for the University of Hawai’i basketball team. Long Beach State controlled the second half in a 65-50 victory over the Warriors in a Big West Conference game at the Walter Pyramid. Hawai’i dropped to 15-8 overall and 3-4 in the Big West; Long Beach State improved 12-11 and 6-1. The 49ers are also 7-0 at home this season. The Warriors raced to a 12-0 lead and stayed in front for most of the first half, but it was all Long Beach State in the second half. Stefan Jankovic led the Warriors with 13 points, and was the only Hawai’i player to reach double-figure points. Mike Thomas added eight points and 10 rebounds. The Warriors shot just 34.5 percent (19-55) from the field, and 41.2 percent on free throws (7-17). The 49ers out-scored the Warriors, 23-7, from the free throw line. The Warriors opened the game by scoring 12 consecutive points, including two steals and subsequent breakaway layups by Bobbitt. The 49ers chipped away at the Hawai’i lead and took a momentary 26-25 lead after Deontae North made two free throws with 1:44 remaining in the first half. A running hook shot by Jankovic put the Warriors back on top, 27-26, heading into intermission. The 49ers opened the second half with a 10-2 surge to take a 36-29 lead. The Warriors missed their first five field goal attempts of the second half. Hawai’i got as close as three, but the 49ers eventually took a 48-39 lead with 10:25 remaining in the second half. 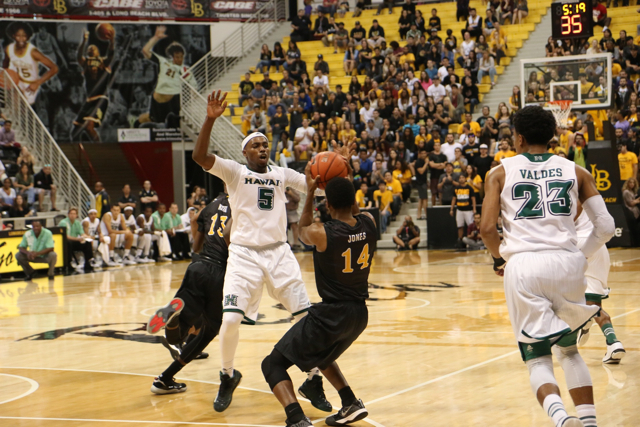 Long Beach State later went on an 8-0 run to increase its lead to an insurmountable 58-41 with 3:42 remaining. The Warriors will remain in California through next week. Their next game will be Thursday, Feb. 5, at Cal Poly. Win one, lose one, win one, lose one. Gotta break that pattern. BWC tourney winner gotta win 3 in a row. No buy in tourneys please. NIT or NCAA. Win as a team, lose as a team and boy, did they lose as a team. Benjy was at a loss for words trying to explain what happened, and who that team was dressed in white. For those interested, the Star-Advertiser has obtained the NCAA letter. There’s a story on breaking news, with a link to the NCAA report. UH went cold in the 2nd half. The difference was at the FT line, LB State hit 23 of 30 FT’s to UH’s only 7 of 17, a 16 point difference there. UH actually made one more FG than Long Beach St. for the game. Ok great game bows,it’s not always up to you guys to win games!!! Coaches win games and it shows we don’t have a very good one in Taylor . We’ve lost 8 games so far and have been leading in 7 of the 8! Only true game we got beat in was the USF game. Hey HU fans let’s stop talking bout how the kids didn’t play good and start talking bout how our kids are being coached, seem like we run one play, Top 25 teams have great coaching if our 5 players played for Duke we would be undefeated !!!!!! I’m just saying we have a solid team,but our coaching is suspect!!!!! WORD AROUND THE NATION IS PLAY A ZONE when playing HAWAII !!!!!! Let’s get these next to on the road and when we come back home fans let’s sale out the stadium and rep that white and green HARD! Pupule, I have to agree.. cannot win one , lose one., that would lead to UH finishing 8-8 BWC regular season. If only they can string together victories, go win 2 or 3 in a row. you are right BWC tournament, have to play well, and 3 wins, NCAA… only way they make NIT, if they win BWC regular season title.. Going to be hard, however this team fought to the end..
That shooting woes, we discussed it all season, have to hit Free Throws, about 75% or better, front end of one and ones, then UH right in game, if not won.. well too late now.. I suspect, UH, if they stick together.. will probably come out with win against Poly. When Janks goes out, there goes the offense.. he is a real threat, inside and out.. When has 3 or 4 fouls not much can do, if he not in game.. Still Love This Team.. They will win more games that is for sure.. just have to get hot, play well in March..And of course make the BWC tournament, ..
clyde: From reading that Allegation Letter from NCAA.. it seems to fall on 2 persons in particular.. for current HC.. unless I am reading it wrong.. present at some practice, … however.. He never initiated.. Another higher up in chain.. of coaching…. alleged..or it seems, really taking control.. directing everything..
That is why, I think current HC, is interim, with possibility of being retained.. ? his role seems to be smaller, not Initiating, or directing.. ? I don’t know.. I feel sorry for this year’s guys, I really do..they can enjoy Super bowl. Noticed, Thomas hand wrapped, Nevels, hand still recovering, Janks knees, now Fleming hand wrapped.. team really beat, up. Wish, if anyway possible , that UH can still recruit.. if HC is in place.. They can recruit 2 bigs that can finish inside.. a threat.. and Defend Rebound..
Janks.. he is a real offensive talent.. Those charging fouls.. LBSU.. told by Monson.. just get set.. because, UH guys were going to try to drive and go to rim, or into paint.. man 6 offensive fouls called against UH and all the missed FT’s, and shooting in 30 percent range.. UH despite the hot start.. I could see, they would have hard time winning by 9 minute mark.. however, until last 6 minutes, they had chance.. Valdes what a slam dunk.. and Janks Two Deeeep threes.. Nevels.. has to catch and shoot 3 ‘s, he has lost some confidence, however… he is recovering from surgery. Watch, this team resilient.. I will be surprised if they do not win 1 or possibly 2 out of these last 2 road games.. Benjy is a battler, and so is his team.. really feel for them. And Beeman? Good job, they have to win tonite and on the road..
Heck, I hope Both MBB and WBB finish with 20 win seasons !! Hey, I might be many things.. a little too over the top for UH hoops, however, The MBB and WBB teams are winning. Hope best for Benjy.. Taylor, and his 3 great kids.. He deserves better, and he cares very much for his team, very , very much.. the families, entrust their care of their sons to him. Go Bows.. Should be interesting..What happens rest of year.. still think MBB can reach 19 or 20 wins and make run in BWC.. and WBB too. wish that darn ncaa made this letter public last October.. save a lot of grief.. sheeesh..
interesting to see how UH and parties concerned respond.. makes for real time drama..
That is the Terrible thing, if student athletes NOT EVEN part of problem.. suffer. darn shame. hope UH goes to work to salvage this season, and lessen length of any sanction probation. Once again.. any comments.. other forum members? I don’t know already.. will give it a rest.. Just supporting team and hoping they bounce back for 2 wins before coming home, I think they can do it.. have to shoot in 40 percent range and better and 75% and better from FT line.. they win,,,With these athletes, keep it real…. they had open threes, and some inside shots, could not get it to drop., and Free Throws.. coach cannot shoot for them.. I guess you win as team, lose as team as clyde says.. and current Acting coach, the record, won loss goes with him… Still think this team will be ready in March for BWC tourney run !! Go Bows !! And Jamie Smith back with UH.. he is good to go ! It looks like a better thing that UH acted decisively, although some had said why did UH do what they did so fast. That they should have waited for the letter first, before letting Gib go, etc. There are mitigating factors listed near the end of the letter, which hopefully will help UH’s case. Such as the acceptance of responsibility, decisive action taken, the self-reporting and the expediting of the investigation. An aggravating factor was that UH had a history of major violations and the 1976 and 1977 were cited for that. That seems like a long time ago. Terrible performance today. Poor shooting. We have a 12 point lead and blow it. Jankovich needs to play inside and get the ball to him inside for a shot and possible foul. Why is Benjy still letting him stay outside the key. Should have played the game with the big man inside. Pound the ball inside and draw the damn foul. They’re jacking threes too early and the results have been awfull. They better get their act together. Come on man Warriors get your butts in gear. Like how comments all supporting bows !! And Janks got to stop making those silly fouls. Too many players crying to the officials, Fleming, Janks, Valdes, etc. enough already, you fouled someone more likely than not. Big test will team stay together mature and be ready in 5 weeks? Chase 20 wins and bwc tour. crown!! islandman….really read carefully mitigating factors..the proactive things UH and under counsel did…looks like ncaa really looks with favor upon that…UH took action…could be…no I Think with help of counsel..really can appeal to ncaa for lessening blows because of cooperation. .
Hope the best..would love to see janks, valdes, nwc, jovanovich, thomas , enos as seniors balling for uh mbb.. I believe Benjy and staff keep team shooting for goal of bwc titles.. 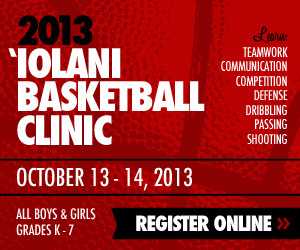 I believe UH hired that well known Firm that works with the NCAA’s. Think it’s been talked about, the penalties. The Letter comes out so as to ask UH if they want to appeal and for that matter I wonder if the NCAA letter was sent to Gib and Akana? I would assume it’s not all on UH but Gib/Akana doings, well, the findings that is. Why would UH want to appeal for Gib/Akana? Alabama legal specializes in helping individuals and schools when faced with ncaa investigation..they are , or have helped put UH on road to lessen blows to UH MBB program..
Ben Jay is telling it true..UH fully compliant and cooperative. . I am just wondering if gib and brandyn will have counsel to appeal? I am no legal expert or ncaa rules guru..
Just hope the mbb team..is alright..
adults and overseers of programs take responsibility..
Wow. Talk about a tale of two halves. What happened in the locker room?!? Let’s regroup and be ready for the next game. You guys can do it. Wow…a D.R. tweet? hope true…sanctions might not be as bad as we think..
think by chancellor coming out and saying how serious UH takes infractions..ncaa likes that too.. Try look for that social media blurb..
or my eyes not good? maybe for offense..go back to original starting DHC 5? Bobbitt, Nevels, Valdes, NNWC and Thomas with Janks, Jovanovich, Fleming , Smith and Niko or even Dyrbe off bench? Wahine in three way tie for 1st place. 54 rebounds vs.34 for CSUN. Men can get FT lessons from King, 9 for 10. (stats say 9 for 9, but i saw her miss one). Nice tribute to Judy Mosley, shown on the streaming. correction, Wahine in 2nd place tie, but have won 5 straight. Hope they, Laura’s gals and Benjy’s Boyz make ncaa’s that would be great!! Finally had a chance to pore over the NCAA document. The hope is the mitigating factors will help significantly reduce any sanctions that school would have received had it waited for the report to surface before imposing penalties on itself. The NCAA acknowledging how UH responded (suspending and then dismissing Akana, and dismissing Gib; suspending Fotu, and the department fully cooperating with the investigation) was the lone positive in the lengthy report. One would hope that acting proactively should weigh in UH’s favor. Then again, who knows how much punishment is sufficient in the NCAA’s eyes? I’ll throw this out there: If counsel feels that might not be sufficient and thinks a postseason ban could be levied, I’d rather the school move forward and self-impose a postseason ban for this year. I’d prefer that rather than drag this out over the next several months. It could result in players transferring and, this late in the recruiting season, how is the coaching staff going to fill the roster for next year? IF, and it’s a huge IF, everyone eligible returns next season that team could be one of the preseason conference favorites and make a legitimate run at the tournament title, even with a reduction in scholarships. Guess we’ll see how this plays out … hopefully, sooner rather than later. BTW: What’s the deal on objects being tossed on the court? The second occurrence resulted in UH getting a technical last week at the Sheriff Center. Today, the second occurrence resulted in the PA cautioning the crowd; no technical. Obviously, no effect on the game’s outcome, but was wondering about the inconsistency in officiating. DR said he’d been hacked, i think. Also, there was something on how to lose weight fast on his twitter, which he has since deleted. that is hope lessen blow..possibility..self imposed bwc post season ban…get over then ready..and you are right..if majority return…only one LOI freshman..everyone else will be juniors and seniors and hopefully a great soph..
that mitigating factors they included in letter..so important..remember other schools hit real hard for not cooperating and misleading by admin..
this mbb team has made thousands of new fans !! clyde hope for softer penalties..let the legal team go to work..with due respect to ncaa and especially team and families who angst over this..
Maybe the officials didn’t see the first object thrown, because the tv guys said Nevels threw it back to the crowd. Some radio commentator said hardly anyone can transfer out, except for a few players, because they already transferred in and at least one was a redshirt or something like that. Hawaiifan…gotta wait and see..those are possible self sanctions..
even espn announcers mentioned allegations UH MBB dealing with..and whomever returning or new coach would the guys leave? well we waited over year for all facts made public so now we see admin and counsel response..for betterment of student athletes..I hope they do right for team!! Now we wait for reply to ncaa..then ncaa’s reply.. Fans..really appreciate..lots just supporting team..game on..fight for championships 15 wins and shot to win 20 plus..great !! that is why only one scholarship freshman. national champ was post season banned for one year because of poor APR..however came back and won ncaa title next year..
know DR really likes this mbb team..no whining about fouls guys!! OK, getting WAY ahead of ourselves, but … neither Thomas nor Jovanovich took a redshirt year so they could transfer, sit out a year, and have 2 to play 2. Valdes could also transfer, but would be left with only one season after sitting out a mandated year. And, of course, Flemings could leave and still have 3 to play 3 after sitting out a year. Let’s hope the violations don’t result in any severe punishments beyond what the school hasn’t already self-imposed. With the potential the team has for next year, I’d take a loss in scholarships and practice time over a postseason ban. clyde…probably the guys being away from hawaii in cali…a good thing..they are focusing on still playing for championships..credit to them and staff..tutors!! the late gavin smith head band and all bombing from just past halfcort. Different era…alluded to by letter…Proactive..cooperative, compliant might be key..
ncaa..they granted gift getting in reyes last minute to UH..maybe they show aloha once again..
MBB and MBB winning and MVB doing well !! MBB and WBB doing well..sheesh cannot type already..!